We celebrated Sutton’s sixth birthday last weekend, and in true Sutton style he requested something less-than-ordinary for his birthday cake. Last year at his request I baked him a six layer rainbow cake, so I should probably be glad that this year his request only included two flavors – chocolate and vanilla swirled together into a single cupcake. 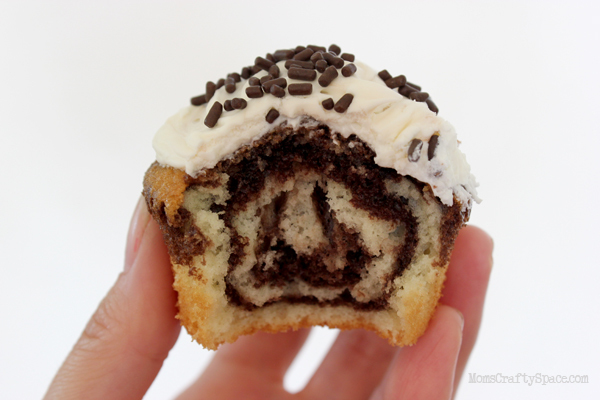 He also asked for chocolate and vanilla swirled frosting, but as you can see, I ended up only using the vanilla icing after my chocolate-filled piping bag exploded with only 20 minutes to spare before party time! Sutton knows what he’s talking about though – these babies would look even more awesome with swirly multi-flavored frosting. I stopped by Safeway to pick up the supplies for my cake and some soda for the birthday party. Safeway (or Vons and/or Pavillions depending on your area) has an awesome Birthday Bundle deal going on right now through May 21st – get (2) two liters of 7-Up brand sodas, (1) Betty Crocker cake mix, (1) Betty Crocker frosting, and (1) 24-pack of Betty Crocker rainbow birthday candles for only $5! You can’t beat that deal! My store didn’t have any signage up about the deal, but as long as you are purchasing the correct items the price will adjust at the register automatically with your club card. 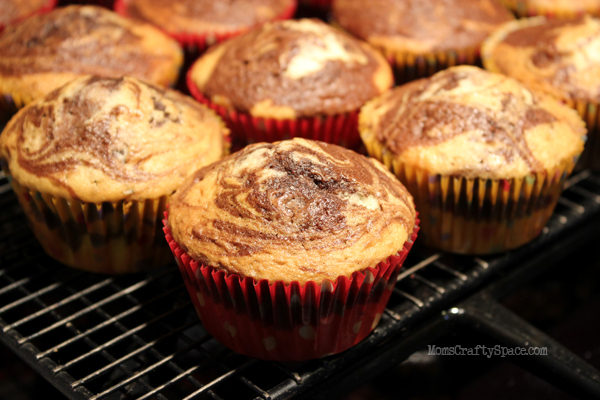 I used a white cake mix and a chocolate fudge cake mix to make my swirled cupcakes, but vanilla and devil’s food would have been a really great combo as well. I needed to make a lot of cupcakes, so I mixed up both individual cake batters as directed, but if you don’t need to make four dozen cupcakes, I have an easy cheat for you. Mix up only the white cake and then separate the batter into two bowls. 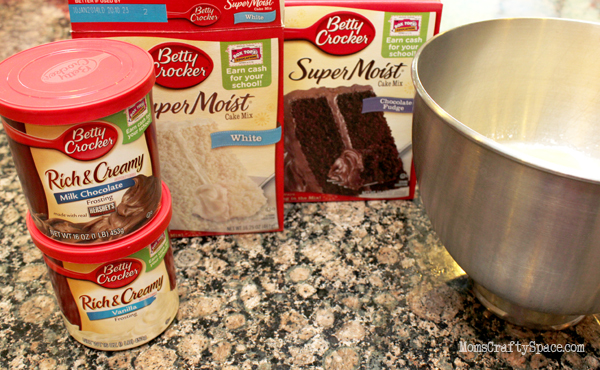 Add about 1/4 cup of the dry chocolate cake mix to one of the bowls of white cake batter, stir, and now you have your two different flavors mixed and ready to go! Alternate scooping chocolate and white batter into each cupcake liner (I used two small scoops of each flavor per cupcake), and then use a toothpick to swirl the batters together. Be careful not to overmix it! Bake as directed and then marvel at those luscious marbled beauties as they cool. 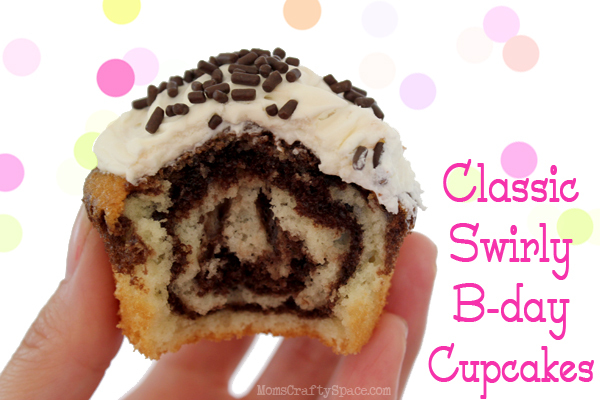 Top with a swirl of Betty Crocker frosting – bonus points if you use chocolate and vanilla swirled frosting! Seriously though…these are pretty darn incredible. They taste amazing, and no one is ever going to guess that “all that hard work” came from two easy peasy boxes of cake mix! 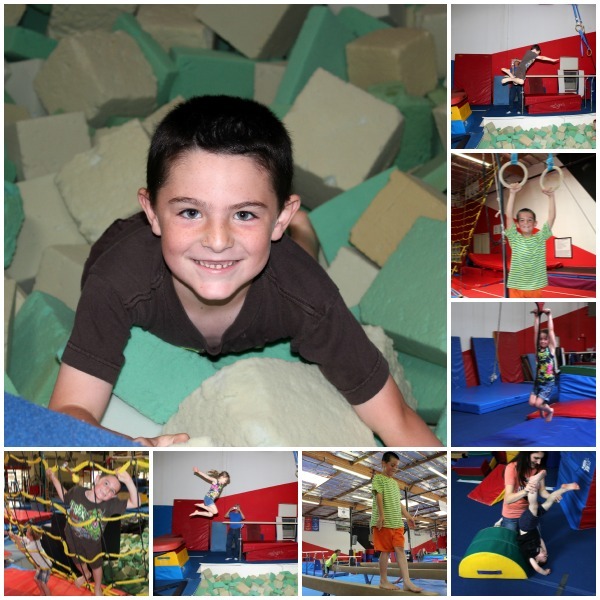 We took our swirled cupcakes to Sutton’s gymnastics party where the kids bounced, flipped and climbed until they were sweaty, red-faced and ready for cupcakes. 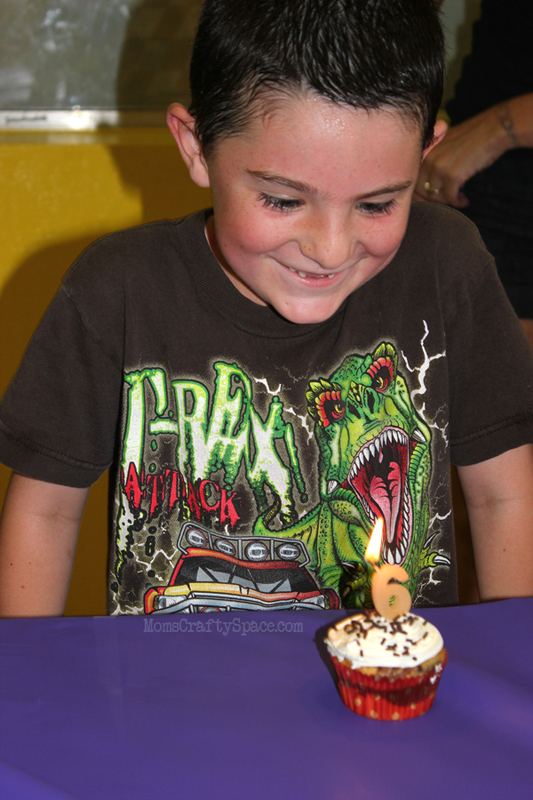 Hope you had a wonderful birthday, my sweet six-year-old! 6? Sutton is 6? And wow is he handsome! Girls–watch out! Yummy cupcakes- look amazing! Yum! Those looks delicious, they almost remind me of zebra print! Also, Happy Birthday to your little guy! These look fantastic! And your son is just too cute! These would be perfect for a girly party too! Pink frosting and sprinkles and you now have an animal print party on your hands 🙂 That kiddo is too cute, and smart too, picking both chocolate & vanilla flavored cakes! 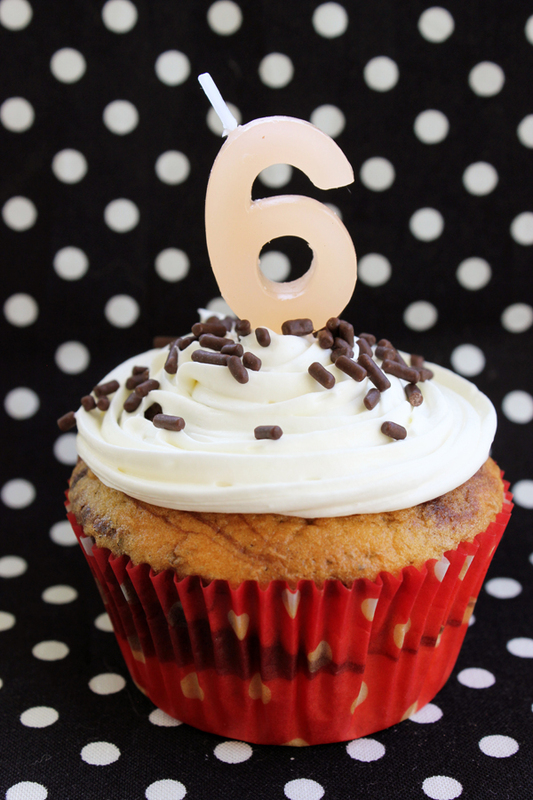 Aww my girls just turned 6 too! Happy Birthday to your guy, and love how creative you got with the box mix! those look so good! I’m forcing myself to avoid Vons so I don’t go buy cake mix and frosting to make those right now!! Yum!